DIY lampshade – Ever throw a kegger and wonder what to do with all your left over party cups that are still in good condition? If you care about the planet, then you’ll most likely scheme out a crafty plan to put these reusable cups into use. 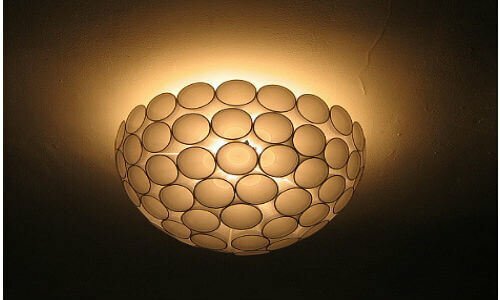 But if not, why not create a one-of-a-kind, spherical cup lamp or unique lampshade? What’s best is that these projects can be completed in just a few minutes with just a glue gun and a ton of cups. You can create a few of these nifty designs and then show off your finished product to friends and family! Optional: Before you begin glue your cups together, you can embellish your cups with glitter and paint. You can use your crafts wood to apply paint and glitter neatly all over the cup. To make this as easy as possible, we are going to create a number of 7-cup hexagonal units. Depending on how large you’d like your lamp to be, you’ll either use more or less cups. When you’re building your first hexagonal unit, be sure to have a central cup surrounded by the 6 other cups. Glue each piece carefully and repeat this step until you’ve gotten the right number of units for your project. Gather all units together and assemble them into a sphere shaped model and glue all units together. If you’re an avid crafter, challenge yourself by creating a unique type of sphere. Once you’re all done with the sticky stuff comes the fun part but first, allow your DIY lampshade to dry for about 20 minutes to half an hour depending on the size of your lamp and voila- you’ve got yourself an easy make lampshade! Impress your friends and family with this amazing and unique in-home design. Happy crafting, everyone!